When it comes to losing weight, there are many ways to do it. Surgically, two of the options are gastric band surgery and gastric balloon surgery. What are the differences between the two? Who qualifies for gastric balloon surgery? If you have a BMI under 35, you likely won’t qualify for gastric band, but you could be a candidate for a gastric balloon. What exactly is a gastric balloon? This is a non-surgical weight-loss procedures that is best suited to those with a significant amount of weight to lose, but whose BMI is low enough that they do not quality for gastric band surgery. During the procedure, a silicone-filled balloon is inserted into the stomach. This essentially tricks the stomach into thinking it is fuller, sooner, causing the individual to eat less food and, therefore, consume fewer calories and lose weight. The deflated balloon is fed through the oesophagus into the stomach and then it is filled with the saline solution. The procedure typically takes about half an hour. Who is a good candidate for gastric balloon procedures? Generally, a person with a BMI (body mass index) measuring between 27 and 35, who needs to lose between at least 10 kg quickly (for medical reasons) and who is willing to follow a strict diet following surgery is a good candidate for a gastric balloon. Why should I choose the gastric balloon over the gastric band procedure? There are many benefits of a gastric balloon over a gastric band. First, the cost of the procedure is much lower because it is a non-surgical procedure. The gastric balloon is only left in the stomach for around six months and then it is removed, after which the patient should maintain their weight loss (usually around 15 kg) by following the diet recommended by their doctor. 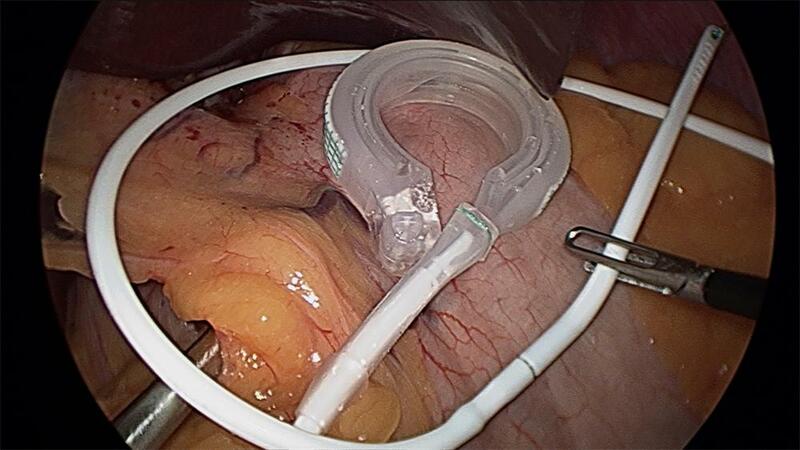 The gastric band, by contrast, is more long-term. The recovery time from gastric band surgery is much longer than that of gastric balloon insertion, which only requires light sedation and no incisions. Will I lose the same amount of weight with both procedures? No. The gastric balloon is designed for people with less weigh to lose than those who are good candidates for gastric band surgery. In addition the gastric balloon procedure is a shorter-term weight-loss solution because it is removed after several months. Because of those factors, the expected weight loss for gastric balloon patients is lower than for those who undergo gastric band surgery. As with any medical procedure, it’s always advised that you talk to your doctor to determine which of these options is best for your particular situation. Your current health, your weight, your overall health and other factors should go into the decision to choose one weight-loss procedure over another. Always remember to ask questions and get all of the information you need before you decide to undergo any surgery. Remember, too, that both of these procedures are meant to be last-resort methods of losing weight; they are not meant to fast-track your weight loss if you haven’t tried to lose weight through healthy eating and exercise first.